A medical problem was the deciding factor in Nutz4pugz’s decision to start losing weight. On the advice from her Doctor she started strength training with a personal trainer to help diminish her constant back pain. 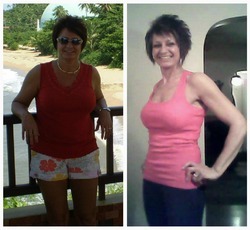 She is also using Calorie Count’s tools to guide her eating habits and has successfully lost 32 lbs. Read on for her weight loss tips, all taken from her own experiences. I have had scoliosis, a spinal deformity, all my life, and have had chronic back pain for 20 years. I have been to 6 specialists in that time who always told me my only option was surgery, and it is a huge, life altering surgery. I had become so sedentary due to pain that I weighed more than I did when I gave birth to my child. The last Doctor I went to told me if I could stabilize my spine I may never need surgery. That was when I realized I was also carrying around 30 pounds of extra weight on my back, which only aggravated my pain. Until the last 8 years, I had never had to diet or watch what I ate in my entire life. I was a constant 115-120 pounds. Getting older, not being active and eating lots of junk with no portion control took its toll. I never counted calories in the past, only watched my fat and carb intake. I would lose about 10 pounds over several months, and no more. My motivation went down the tubes and I would go back to my old eating habits. In November 2011 I started working with a trainer at the gym 1-2 times a week hoping to learn exercises to strengthen my back without injuring or aggravating it. What I didn’t know was he would also incorporate nutrition and weight loss into my plan. I learned alot! I went from eating mostly processed foods and diet soda (sugary cereals, white breads, frozen meals, chips, etc) to all whole grain foods, lots and lots of veggies and fresh fruit (which I NEVER ate before), and all lean proteins. And tons of water! I actually crave water now, which in the past I never could bring myself to drink! I just started Shakeology which I love because I love chocolate and blending it with unsweetened almond milk and ice makes it taste like soft serve ice cream and it really sticks with me. My goal has been to go to the gym at least 3 times a week, and do strength training at home on the off days. I used to go straight home from work and hit the recliner with my heating pad. The most important change has been to my attitude. 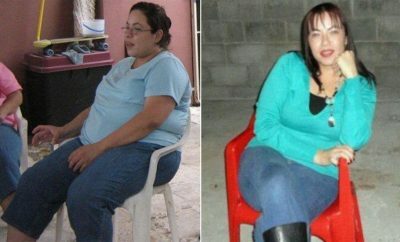 I can sit at home in the recliner and be in pain, or I can go to the gym and exercise, be healthy and have more energy. Either way I will still have pain. However, that pain has lessened due to the fact my back and leg muscles are better supporting me now. And I feel great after doing cardio! I found Calorie Count about 2 months into my program. Up to that point I had been keeping a handwritten food diary to log my 1200 calories a day. I think if I hadn’t found Calorie Count, I would have been tired of manually counting calories, and possibly lost interest in keeping track long before now. I think I would still be eating healthier, just not keeping as track of calories and nutrients as well. My boyfriend will ask me what I am doing on the computer, and I reply “Logging my food!” Logging on Calorie Count has become as addicting to me as Facebook! It has become a challenge to see if I can meet, beat or surpass my goals each day. On bad back days, after sitting at a desk all day, sometimes I have to really talk myself in to working out. Getting motivated to exercise when you hurt before you start is hard, but I am always glad that I did. I am trying to build muscle, and have recently upped my protein and lowered my carb intake. I am finding it a challenge to eat more protein, less carbs and stay within my daily calorie intake. I lost 32 pounds on the scale, so probably more in fat since I have gained muscle, since 11/1/11. Even through the Holidays! I realized I was a success when I had to buy ALL new clothes, and now some of those are too big. When I look in the mirror and don’t see my muffin top anymore I am inspired! I allow myself one ‘free’ day a week, usually on a day I work out, to keep from feeling deprived and getting bored. I still try to make good choices like a baked sweet potato opposed to a baked white potato. Notice I don’t call it a ‘cheat’ day. My thoughts are that most people diet until they get to their goal weight and then slowing go back to their old eating habits. I am learning to eat to live, not live to eat. I feel better, I look better, and I am more energized. Eating all the junk I used to eat made me sluggish. I used to drag myself out of bed at 5 a.m., and now when the alarm goes off I just pop right out of bed! I am still losing, so maintenance hasn’t started yet. But I am sure I can do this if I keep logging my calories. Keep active, a body in motion stays in motion. Plan meals in advance, I log my food on Calorie Count for the entire day all at one time. If something changes I change it, but this seems to keep me focused. Set small goals so you are not overwhelmed; once you meet them try to exceed them. Then set a new goal. Keep a healthy snack in your purse or your car. If I am out and about and feel like I am going to crash, I eat my snack so I don’t start cramming in food as soon as I get home!